Our Advanced Facial Treatments use the Environ line of medical grade skin care products to transform your skin naturally. During each visit Renata will analyze your skin type and deliver the right combination of corrective and preventative anti-aging for your treatment. During the week prior to your treatment. While most people can benefit by the FACIAL - there are some absolute contraindications; it cannot be performed on persons with epilepsy, pacemaker or anyone with active cancer. Combining hyperbaric pressurized oxygen with O2 rich infused serum to penetrate into the skin to balance and restore hydration levels as well as plump and ﬁrm your skin. Well-researched and FDA approved LED Light Therapy benefits not only your skin but also your body’s overall health. By shining a particular colored light on your face or body for a certain amount of time every day can treat conditions such as acne, rosacea, psoriasis, fine lines and wrinkles, and hyper-pigmentation while reducing surface inflammation. Combines a custom-blended LIGHT peel to inhibit skin discoloration and melanin production. Diamond Microdermabrasion. Ultrasonic aids in deep penetration of nutrients that close the pores, while stimulating collagen & elastin production. 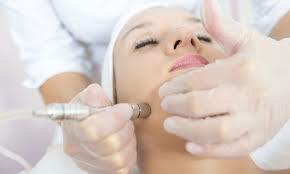 If your skin has become dull or damaged from aging or exposure to the elements, it may be a good time to perform a thorough exfoliation with a series of Diamond Dermabrasion treatments.First, a custom-blended light peel lifts away surface impurities; then a Diamond Tip takes dull layers off your skin and years off your appearance by polishing away old cells and stimulating collagen production, revealing healthy glowing skin and prepares skin for extractions. A vitamin enriched mask follows to nourish and hydrate your skin. A highly effective facial designed to combat the root causes of acne such as congestion, bacteria and inflammation, and works to correct problem areas. This targeted treatment focuses on thorough pore extractions and use of blue light LED and oxygen therapy to help control oil and kill bacteria. An acne reducing peel will be included if appropriate for the clients needs, if not a customized calming mask will replace the peel. End result will help to reduce acne breakouts and refine uneven skin texture for a refreshed, clean and clear complexion. This treatment drastically reduces fine lines and leaves your skin feeling and looking younger. The ReZENerate NANO-NEEDLING TECHNOLOGY painlessly creates hundreds of thousands of superficial microscopic permeations on the surface of the skin, leading to an immediate plumpness. Its also allows for greater absorption of the nutrients introduced into the skin during the treatment. This treatment is customized for each client, and is totally relaxing. Includes double cleansing, an enzyme peel, extraction and O2 Therapy rich infused serum to penetrate into the skin to balance and restore hydration levels as well as plump and firm your skin. A custom mask penetrates the skin while medical Ultrasonic LED is used to transport essential vitamins and nutrients leave your skin clear and firm. This is a fabulous choice for someone who wants a truly corrective treatment without any downtime. It is proven to restore, refresh, and renew the skin. *A series of four to six Regenerate treatments over a period of two to three months is recommended to achieve the maximum results and benefits.If you are sensitive, we can numb the skin for you. 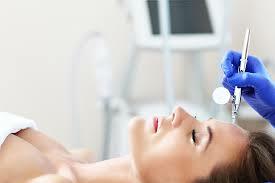 Includes: Oxygen Therapy,Ultrasound LED, lip and eye treatment. Oxygen Therapy, Diamond Microdermabrasion, Nano-needling Therapy, Ultrasound, LED Light Therapy Panel, Lip and Eye Treatment. Gentle Microcurrent stimulate over 35 different muscles in your face to help lift and tighten it and create a natural facelifting result. Our bodies recognizes this electricity and allows it to accelerates the body abilities to function more effectively. Microcurrent ‘work outs’ your muscles individually just like having a personal trainer to guide your muscles properly. 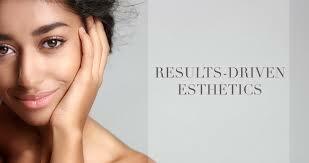 In result, your muscles are stronger, tighter, and healthier creating a youthful foundation for your skin. We recommend this treatment for anyone nearing or over forty years of age. Finally, The O2 Therapy rich infused serum to penetrate into the skin to balance and restore hydration levels as well as plump and ﬁrm your skin. Micro-current Therapy stimulates a small electric pulsation, imitating natural electric currents in the body. The electric waves boost the production of collagen, elastin, and ATP, stimulates lymphatic drainage, tightens skin, and increases blood circulation. In combination with LED Light, it whitens and removes dark eye circles, activates enzymes, stimulates metabolism in tissues, and much more. Microcurrent creates a real lifting effect by increasing collagen production and improving facial contour. 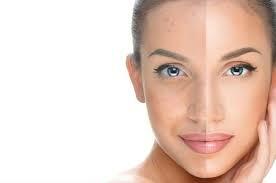 Lifting and lymph drainage massage and micro current technique, this powerful treatment gives face definition and a visible lift. BUY SERIES OF 5 SKINCARE SERVICES, GET 1 FOR FREE!